Welcome to this week’s installment of Kim’s Stuff. This week I am once again featuring a past gift of DeckACards. 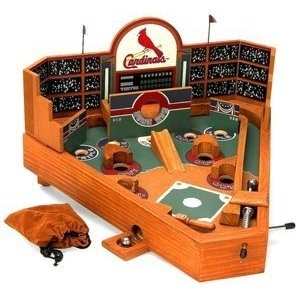 I am always on the lookout for fun and unique Cardinal gift ideas, and when I saw the St. Louis Cardinals Classic Mini Pinball Machine, I knew it would be a fun addition to his office. One has recently been auctioned off for charity for a hundred dollars, but you can own your own starting just under $23.00. « State of the Nation Podcast: Gateway to Baseball Heaven Edition!